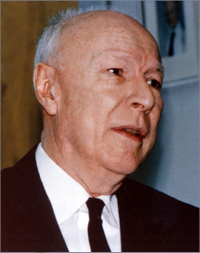 William Vermillion Houston was Professor of Physics and Honorary Chancellor at Rice University (1946-1968). Other institutional affiliations included California Institute of Technology and the University of Munich. His research interests included spectrum analysis and the fine-structure constant. January 19, 1900Birth, Mount Gilead (Ohio). 1920Obtained BA and BS, Ohio State University, Columbus (Ohio). 1921 – 1922Obtained MA, University of Chicago, Chicago (Ill.). 1925Obtained PhD in Physics, Ohio State University, Columbus (Ohio). 1925 – 1946National Research Fellow (1925-1927); Assistant Professor of Physics (1927-1929); Associate Professor of Physics (1929-1931); and Professor of Physics (1931-1946), California Institute of Technology, Pasadena (Calif.). 1927 – 1928Guggenheim Fellow, University of Munich. 1928Guggenheim Fellow, University of Leipzig. 1941 – 1945Director of Special Studies, Division of War Research, Columbia University. 1946 – 1968President, Rice Institute (1946-1960); President, Rice University (1960-1961); and Professor of Physics and Honorary Chancellor, Rice University (1961-1968), Rice University, Houston (Tex.). 1954 – 1966Member, National Science Board. August 22, 1968Death, Edinburgh (Scotland). PhD advisor at Ohio State University, "Structure of the red line of hydrogen and the interpretation of doublets in other elements." Advised by Houston at California Institute of Technology, "Experimental and theoretical studies of the breadth and structure of the Compton shifted line." Advised by Houston at California Institute of Technology, "The vibrational spectrum of a mon-atomic face-centered cubic crystal lattice," and both employed at California Institute of Technology. National Research Fellow; Assistant Professor of Physics; Associate Professor of Physics; and Professor of Physics. President; Professor of Physics; and Honorary Chancellor. Obtained BA and BS (1920) and PhD in Physics (1925). Joint ceremonial session of the American Physical Society and the American Association of Physics Teachers [sound recording], 1963 January 24. Oral history interview with W. V. Houston, 1964 March 3. W. V. Houston papers, 1925-1968 (bulk 1941-1968). Fondren Library. Woodson Research Center. William V. Houston intellectual autobiography, 1962. Principles of quantum mechanics; nonrelativistic wave mechanics with illustrative applications / W. V. Houston. Principles of quantum mechanics; nonrelativistic wave mechanics with illustrative applications. Former Rice President William V. Houston Physics Today obituary.